The parish of Baconsthorpe in north Norfolk is located southwest of Sheringham between Plumstead and Bodham. The origins of the village may be Norman, as the name implies ownership of a farmstead or hamlet by the Bacon family. Bacon is an old French nickname. The Domesday survey of 1086 records three landowners, but also the names of tenants prior to 1066 showing there was settlement here before the Norman invasion. 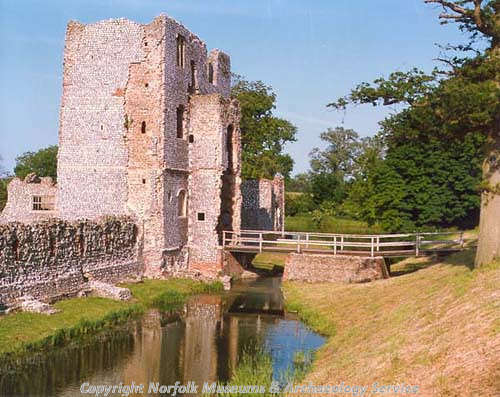 There are plenty of archaeological remains from the Roman and medieval periods, including the 15th century Baconsthorpe Castle and Hall owned by English Heritage and open to the public. There is some evidence for prehistoric activity. Although no scatters of worked flint have been recovered individual finds of a Neolithic axe or adze (NHER 35205) and a Neolithic scraper (NHER 35207) are the earliest archaeological finds in the parish. A Bronze Age socketed axe (NHER 6556) has also been found and close to Breck Farm are the cropmarks of a Bronze Age ring ditch (NHER 6566). There is also a prehistoric burnt mound nearby (NHER 17942). There is ample evidence for Roman activity, again concentrated in the north of the parish. Reports of a Roman villa (NHER 6560) near Baconsthorpe Hall are based on the recovery of scatters of building material and pottery, although these could derive from a settlement or a less high status building. Similar scatters of Roman material (NHER 17942, 18060 and 18061) are recorded close to the Bronze Age barrow and may represent a Roman settlement. A Roman coin hoard (NHER 6559) of 9000 to 17000 silver and copper alloy coins dating to the 3rd century has also been found to the north of the parish. Despite the recording of two pre 1066 landowners’ names in the Domesday Survey (Ketelbern and Wulfric) there is no recorded archaeological evidence for Saxon activity in the parish. From the medieval period we have a number of buildings that can still be seen today. There is evidence that there was a manor dating to earlier than 1480 on the site of the later 18th century Manor House (NHER 22841). The parish church of St Mary’s (NHER 6575) is mainly 14th century, but some parts of the 13th building survive in the chancel. 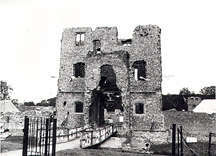 Half of the tower fell in 1739 and was rebuilt in 1788. Baconsthorpe Castle (NHER 6561) is a 15th century flint faced fortified and moated manor house that was built by the Heydon family. The gatehouse (Baconsthorpe Hall) outside the moat was added in 1560 when the older structures were converted into a factory producing woollen yarn. They were partially demolished in 1654 to provide building material for nearby Felbrigg Hall and are now in ruins, although the outer gatehouse was lived in until 1920. The site is managed by English Heritage, which operates a free entry policy. It is open all year for visitors. 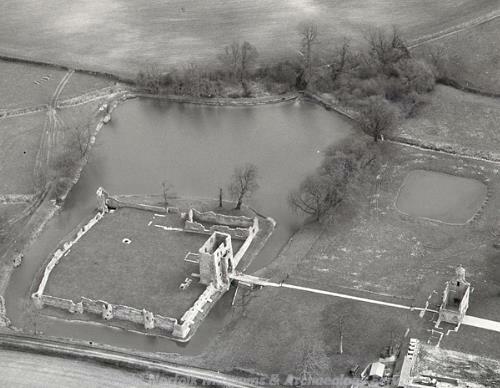 At Manor House (NHER 22841) the pre 1480 manor house was replaced in the later 16th century. This building was in turn demolished and an 18th century house was constructed in its place. Other evidence of post medieval activity includes scatters of post medieval building material and pottery throughout the parish, including some Flemish floor tiles (NHER 35209). Several demolished medieval and post medieval buildings (NHER 32947 and 35204) have been identified this way. Others still stand. Pitt Farm (NHER 29087) is a 16th or 17th century building that has been traditionally associated with Anne Boleyn. Other archaeological sites within the parish have been discovered by chance. An undated brick culvert (NHER 32948) was discovered in a field when a tractor fell into it – reports suggest nobody was hurt. Megan Dennis (NLA), 3rd August 2005.
http://www.edp24.co.uk/Content/Leisure/Walks/asp/Baconsthorpe.asp. Accessed 26 January 2006.
http://www.english-heritage.org.uk/server/show/conProperty.2. Accessed 26 January 2006.
http://www.roll-of-honour.com/Norfolk/Baconsthorpe.html. Accessed 26 January 2006.
http://en.wikipedia.org/wiki/Baconsthorpe_Castle. Accessed 26 January 2006.